Green Olive Tours Blog • Palestine • Israel: The Halakhic State of Israel. Is it coming? Is it here? The Halakhic State of Israel. Is it coming? Is it here? A new religious phenomenon has arisen in Israel during the past few years. The movement known as ‘Haredi Leumi’ or National Ultra-orthodox (חרדים לאומיים) is gaining adherents daily, and is developing into a major force in shaping the future of the country. The combination of religious zealotry, fundamentalism and radical nationalism is setting the stage for the transformation of Zionism from its secular origins into a unyielding religious/authoritarian ideology. The Israeli academic, author, and human rights activist, Israel Shahak, predicted this development over two decades ago. His warnings were ignored. His writings ridiculed, and his opinions relegated to the sidelines of national life. Yet Shahak’s prognosis has emerged as a new reality in Israel. The best way to conceptualize the development of a Jewish religious state, is to imagine a Judaic version of Iran or Saudi Arabia. These countries base their legislation on Sharia Law. Similarly Israel may well develop into a state that bases it’s laws on the Jewish version of Sharia, known as ‘Halakha’, Jewish religious law (הֲלָכָה). All Orthodox Jews follow Halakhic Law, regardless of the country where they live. It is a highly structured framework within which religious Jews live their lives. The practice includes submission to Halakhic courts, which, like Sharia, are voluntary in Western democracies, yet mandatory in Israel. The Israeli religious courts already have coercive legal powers, which penetrate deeply into the lives of Israel's citizens. The first Israeli government empowered both Sharia and Halakhic courts with legal jurisdiction over the Muslim and Jewish populations of the country. This power, at least for the Jewish religious authorities, is steadily increasing. The Israeli Jewish religious landscape is complex, ranging from a tiny minority of mostly liberal Americans who attend private Reform and ‘Masorti’ or Conservative (מָסָרתִי) synagogues, to the various orthodox and Ultra-Orthodox denominations that are sanctioned and largely financed by the government. Some of the Jewish religious sects have donned the mantle of Zionism in contrast to the often vehement opposition to the idea of a Jewish State by virtually all religious Jews during the ideology’s early development. Nationalist sentiment among religious Jews grew dramatically in the aftermath of the 1967 Six-day War. Religious Zionism awakened, and the subsequent Occupation enabled access to the biblical sites in Jerusalem, Hebron, Shilo, Nablus, and more. The heartland of ‘Eretz Israel’, the Land of Israel (אֶרֶץ יִשְׂרָאֵל) became available for Jewish settlement, and the population of East Jerusalem and the West Bank (Judea & Samaria) continues to grow at a rapid pace, now numbering over 650,000 Israeli Jews. The settler population is growing at over 5% per year, about double the rate of the Israeli population as a whole. An ever increasing proportion of settlers are religious Jews. Most of the early settlers, and the people driving the movement today, are known as the ‘Dati Leumi’ or National Religious (דָּתִי לְאוּמִּי). They generally look and dress like the secular population with the exception of wearing a ‘kippa’ (כִּיפָּה) or yalmuke for the men, and modest dress, including the covering of the hair with a hat or scarf for the women. The National Religious are fervent Zionists who serve in the army and form the core of the most radical settler movements. They often send their children to military high schools and as a result, the proportion of religious career officers in the IDF (Israel Defense Forces) is much higher than their percentage in the general population. According to the Israeli military journal, Ma'arachot, the percentage of religious military officers jumped from 2.9% in 1990 to 31.4% in 2007. The Israeli bureau of Statistics reports that in 2007 the National Religious population was just 15% of the total. Thus they are represented in the Israeli military by more than double their numbers in the general population. This trend is reflected in Israel’s Knesset (Parliament), government and ministries, where religious politicians and bureaucrats are now ubiquitous. This troubling development is further compounded by the rise of the Haredi Leumi, the Nationalist Ultra-orthodox population, who have more extreme fundamentalist religious views. 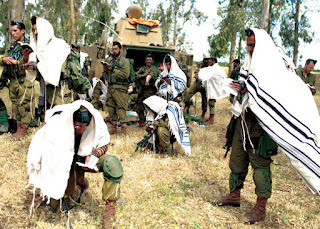 However unlike other Ultra-orthodox Jews, they have grafted on a nationalist component, serve in the military and often make common cause with their Dati Leumi or National Religious cousins in matters concerning the settlements and Occupied Territories. Both Orthodox, and the Ultra Orthodox Jews (and their Christian Evangelical allies) have been instrumental in mainstreaming the idea of building the Third Temple. Organizations such as the ‘Temple Mount Faithful’ and the ‘Temple Institute’ in Jerusalem are growing rapidly. Where once these groups were largely ridiculed and marginalized in Israeli society, today Knesset members and government ministers make public announcements in support of rebuilding the Temple, and attend these organizations’ events. Other influences include an increase in the teaching and practice of Judaism in state ‘secular’ schools, and a recent massive increase in school field trips to Jewish religious sites in the Occupied Territories, such as Abraham’s Tomb in Hebron, and the ancient site at Shilo. This phenomenon will have two primary ramifications for Israeli and Palestinian society. First, the ongoing and accelerating increase in the settlement population is cementing the demise of the two-state solution. Secondly the laws and regulations governing Israeli society will increasingly be based on biblical edicts and Halakhic Religious Law. The combined effect will likely be catastrophic. Israel may descend into the same morass that afflicted medieval Europe and some of today’s Islamic regimes. Modern societies cannot be governed by intolerant religious dogma developed thousands of years ago, without undermining the freedoms and principals of fair play, pluralism, and human rights that have evolved in the modern era. Israelis are doing nothing to reverse this trend, and indeed are mostly participating eagerly in the evolution of a society within which many of them eventually may not have a place. Fred Schlomka is an Israeli businessman and the Managing Partner of the Green Olive Collective Inc. Yes, it's scary! My mother came to Palestine in 1935 from Europe, as a committed Zionist and member of Hashomer Hatzair. She left for Britain in 1948 but was always very loyal to Israel. She will be turning in her grave at these developments in the country she loved. For the uninitiated - 'Mashiach ben David' is transliterated from Hebrew and means 'Messiah son of David'. The anonymous writer is obviously a religious Jew and like most religious Jews, he/she believes that the Halakhic State will be born when the Messiah arrives.